Jade never ventures beyond the walls of her family's Inner Court; in seventeenth-century Korea, a girl of good family does not leave home until she marries. She is enthralled by her older brother's stories about trips to the market and to the ancestral grave sites in the mountains, about reading and painting, about his conversations with their father about business and politics and adventures only boys can have. Jade accepts her destiny, and yet she is endlessly curious about what lies beyond the walls. 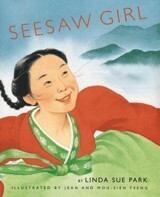 A lively story with a vividly realized historical setting, "Seesaw Girl" recounts Jade Blossom's daring attempts to enlarge her world. "In descriptive, engaging prose, the story portrays the culture, traditions and daily lives of the Korean aristocracy in a time of political and cultural change." Weiterführende Links zu "Seesaw Girl"
Unser Kommentar zu "Seesaw Girl"